In addition to the Arrays class, Java provides an ArrayList class which can be used to create containers that store lists of objects. ArrayList can be considered as a growable array. It gives you fast iteration and fast random access. ArrayList implements the new RandomAccess interface—a marker interface (meaning it has no methods) that says, "This list supports fast (generally constant time) random access." Choose this over a LinkedList when you need fast iteration but aren't as likely to be doing a lot of insertion and deletion. Earlier versions of Java have one legacy collection class called Vector which is very much similar to ArrayList. Vector implements a dynamic array. A Vector is basically the same as an ArrayList, but Vector methods are synchronized for thread safety. You'll normally want to use ArrayList instead of Vector because the synchronized methods add a performance hit you might not need. In this tutorial, we will discuss ArrayList only considering all is applicable to Vector as well. You can add an item at any point in an ArrayList container and the array size expands automatically to accommodate the new item. You can remove an item at any point in an ArrayList container and the array size contracts automatically. To state the obvious: Arraylist is an ordered collection (by index), but not sorted. You can also specify a capacity/size of initial ArrayList as well as create ArrayList from other collection types. Java Program to demonstrate the use of all above methods described above. Here we are creating ArrayList named myList and adding objects using add() method as well as using index based add method, then printing all the objects using for loop. Then there we demonstrate use of get(), contains(), and size() methods. the output of program is shown below the java code. ArrayList and Vector are similar classes only difference is Vector has all method synchronized. Both class simple terms can be considered as a growable array. 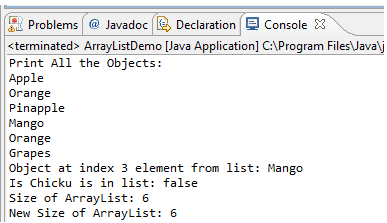 ArrayList should be used in an application when we need to search objects from the list based on the index. ArrayList performance degrades when there is lots of insert and update operation in the middle of the list.